We had the opportunity to facilitate a review for a Portable Outdoor Camping Lantern LED Light . Our family loves to go camping in the summer and the fall. We are always looking for great deals on camping accessories to add to our camping gear. I received the Portable Collapsible Camping Lantern from Etekcity. The stylish, modern design features a high intensity 360 degree white light with 30 low current consuming yet bright and durable LED designed to save battery life and prolong usage. The Etekcity package included the super bright collapsible LED Camping Lantern and 3 AA batteries. The collapsible design is made out of lightweight material for quick operation. Two foldaway metal handles makes it easy to carry the lantern or suspend it. There is no power switch, its easy to function. Just pull top upwards to turn it on and collapse it to turn it off. So simple even the kids can manage it. The lantern is designed to last a long time by consuming less power, with 30 individual LED bulbs, and delivers 360 degrees of illumination. With adjustable brightness levels the lantern will give off 8 hours of high intensity light and up to 72 hours of regular continuous operation. 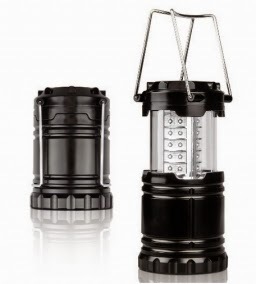 The lantern is hand-made with military grade, water resistant plastic. It is extra durable. We are thinking of purchasing a couple more of these great portable lanterns. Not only will they be great for our camping trips but in an emergency they would come in real handy, such as a power outage. You can purchase yours for an affordable price over on Amazon . This is a very nice LED outdoor camping lantern that I would love to get for camping this summer. I will have to look into getting one of these because they really save energy and money!